E-Beam evaporation is a physical vapor deposition (PVD) technique whereby an intense, electron beam is generated from a filament and steered via electric and magnetic fields to strike source material (e.g. pellets of Au) and vaporize it within a vacuum environment. At some point as the source material is heated via this energy transfer its surface atoms will have sufficient energy to leave the surface. At this point they will traverse the vacuum chamber, at thermal energy (less than 1 eV), and can be used to coat a substrate positioned above the evaporating material. Average working distances are 300 mm to 1 meter. Since thermal energy is so low, the pressure in the chamber must be below the point where the mean free path is longer than the distance between the electron beam source and the substrate. The mean free path is the average distance an atom or molecule can travel in a vacuum chamber before it collides with another particle thereby disturbing its direction to some degree. This is typically around 3.0 x 10-4 Torr or lower. The main reason to run an e-beam evaporation process at the high end of the pressure range is to allow a wide beam ion beam source to be employed simultaneously for film densification or other property modification and wide beam ion beam sources do not typically operate below 1x10-4 Torr. 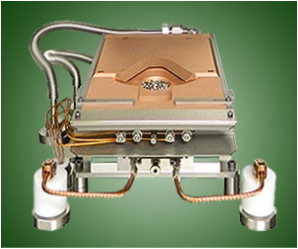 Evaporation without ion beam assist can be done at any pressure below this although the process always increases the pressure due to outgassing of some things within the vacuum chamber. Allowing evaporated atoms/molecules to traverse the working distance (between source and substrate) undisturbed by other residual atoms/molecules ensures "line of sight" arrival of material which is ideal when some type of masking is employed. The low arrival energy is also advantageous for sensitive substrates, although the radiation from the intense electron beam energy transfer below the substrate would typically predominate. A water cooled copper block is bored out to have a "pocket" in the shape of an inverted, truncated, cone. Source material is placed within this pocket or within a crucible whose exterior fits squarely within the pocket. The crucible has a smaller, similar pocket within it. A magnetic structure consisting of a permanent magnet and two pole extensions are located around the block such that its field lines run parallel to one side of the block. On the the same side of the block (below these primary field lines) is a filament which produces electrons by thermionic emission and is formed into a beam - this is called the emitter assembly. This electron beam is "steered" by these field lines in a 270o arc to impinge on the center of the pocket. The electron beam's energy is controlled such that the magnetic field will bend it precisely into the center of the pocket. An additional electromagnetic coil known as the "sweep coil" is employed to effectively raster the beam around the surface of the contents of the pocket to evenly heat the source material - this part of the operation is typically referred to "XY sweeping". A variety of sweep patterns are used in the control program for the electromagnetic coil. Materials with lower melting points melt readily and fill the crucible - they do not require an XY sweep. Materials with high melting points require an XY sweep to prevent the e-beam from "boring" a hole in the melt and subsequent "spitting" which creates large nodules of the source material in the growing thin film (undesirable). 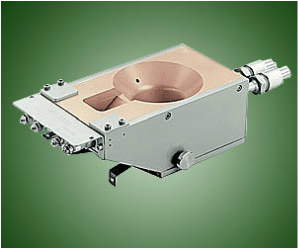 A rotary pocket electron beam source has all the same parts as a single pocket unit except that the water cooled copper block is essentially a turret of multiple pockets each of which can be indexed into position. With this design a number of different materials can be evaporated sequentially from a common magnet/emitter/sweep coil structure. Obviously this design includes additional shielding to prevent cross contamination of the source material in the pockets. The pocket in "position" is chosen via a motorized, rotary "indexer". A linear pocket electron beam source is similar to a rotary pocket source except that its pockets are arranged in a line and are indexed into position in a linear fashion within the common magnet/emitter/sweep coil structure.